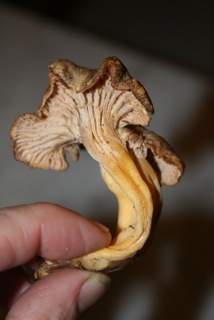 On a recent mushroom hunt with Sonoma-based preserver and gleaner Elissa Rubin-Mahon we found a load of the sooty little Craterellus tubaeformis, known as the yellow foot or the winter chanterelle. Lots of people look down on this mushroom, but they shouldn’t: it is delicately peaty tasting, and perfect, as Elissa pointed out, cooked with scotch. I brought about 4 pounds of the chanterelles home in pie boxes and cooked them the next day, in a pan sauce made from a couple of T-bone steaks, and a smoky 10 Year old scotch, and dumped on top of the sliced beef. The flavor of the dish was indeed peaty; a combination of damp leaves, tobacco, sweet steak fat and the wonderful muscular smell of mushrooms, and as close to the deep coastal woods of California as I could get in Manhattan. Rub the steaks with the oil. Pan fry the steaks in a well-seasoned salted iron skillet over a medium high heat until medium rare (125' F), about 10 minutes on the first side, and 5 on the other. Remove the steaks and keep warm. Pour any fat out of the skillet (there won’t be much). While holding the pan off the flame, add the scotch and chicken broth to the skillet. It will bubble up. Return to the flame and loosen the browned bits of steak with a wooden spoon. Reduce by about a quarter. Add the chanterelles. Cook until the mushrooms are soft, about 10 minutes. Swirl in the butter and add salt and freshly ground black pepper to taste. 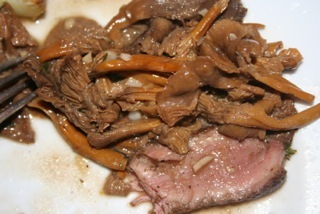 Slice the steak on the bias and garnish with the mushrooms. Garnish with a few sprigs of fresh thyme, or sprinkle with chopped fresh thyme.